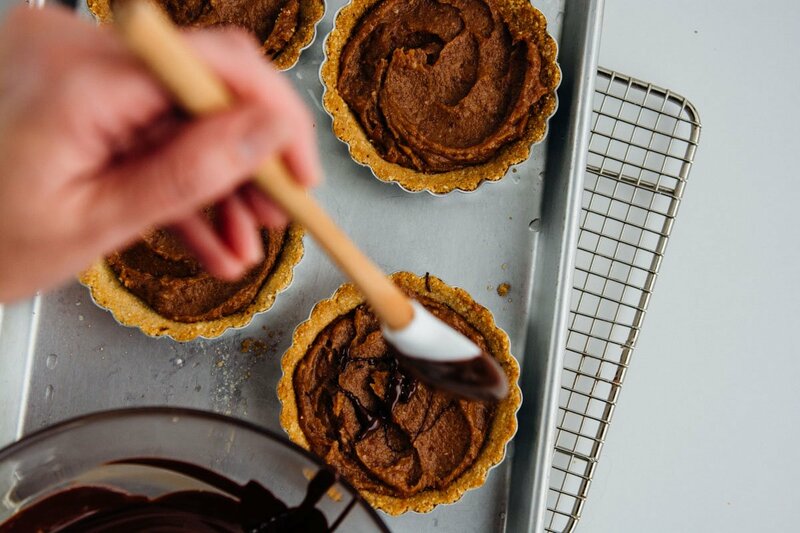 Finding desserts that are dairy free can be a frustrating and challenging endeavor. 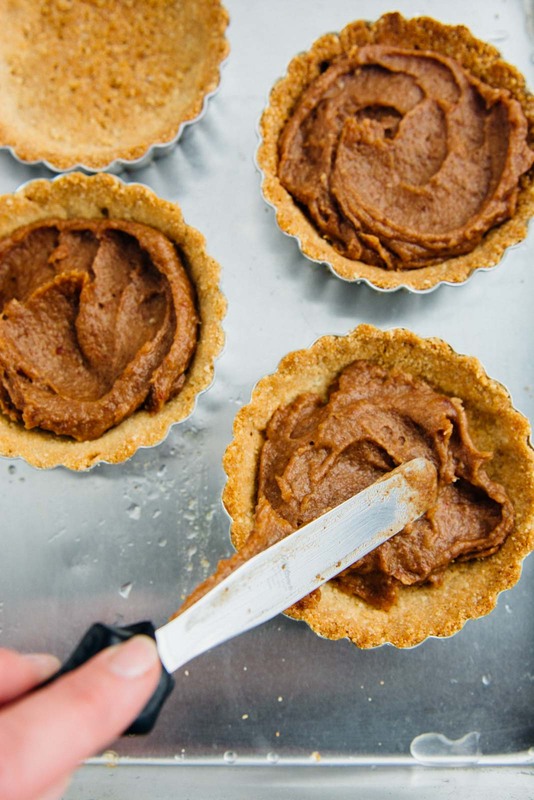 It’s fairly easy to find main dishes, but even here in Vegan-friendly Portland, it’s difficult to find a real dessert that doesn’t contain butter or milk. I don’t’ want my son to feel left out, so I’m always experimenting in the kitchen trying to find healthy-ish desserts to make for him. 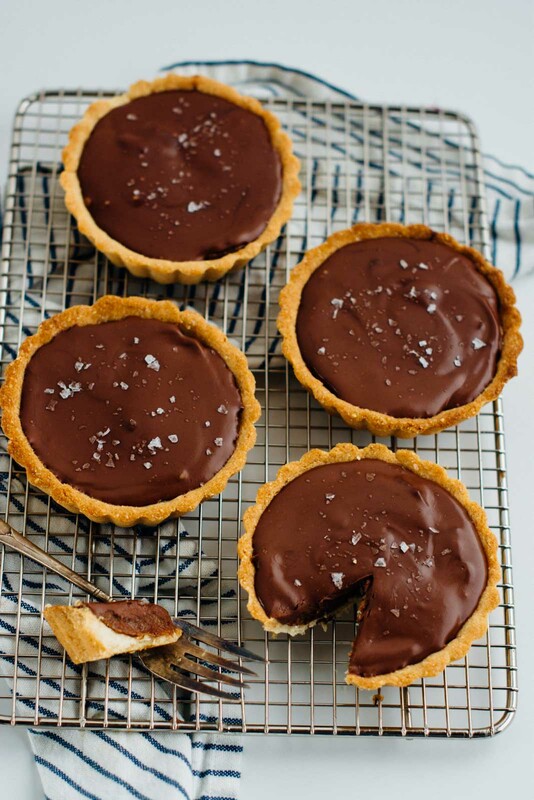 These salted caramel chocolate tarts utilize the amazing date caramel I posted last week. We’ve also been making salted caramel rice crispy treats as well, so I think there will always be a jar of this stuff at the ready in the refrigerator. These do take a bit of planning since they require some chilling, but they aren’t all that complicated. 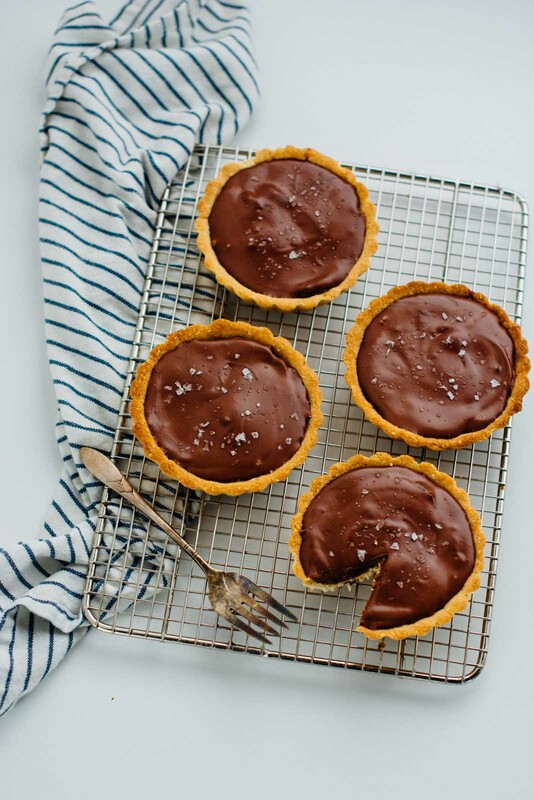 First, you make a simple press-in crust with almond flour, coconut flour, and sweet rice flour, top with some date caramel and finish off with a rich chocolate ganache. It took me a few tries to come up with the results I was looking for, but we happily ate them all. 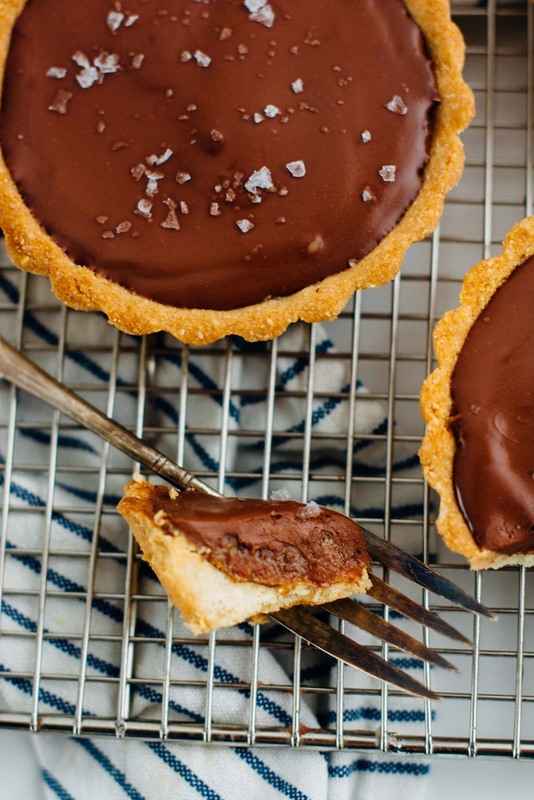 Actually, it took three tries before I was happy with the tarts. The first try, the crust was too crumbly and the ganache kept splitting on me. 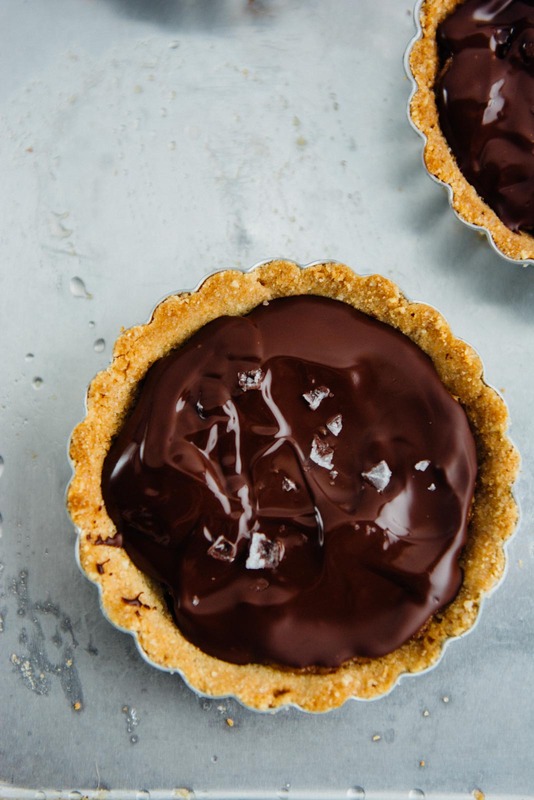 The second time I used a combination of chocolate and coconut oil and they looked great but having a hard layer of chocolate on top of the filling made it messy to eat and I wasn’t wild about the flavor. Finally, I settled on a combination of melted chocolate and coconut milk and the texture was just perfect. I adapted the crust from The Bojon Gourmet and as a bonus, it’s gluten-free as well. 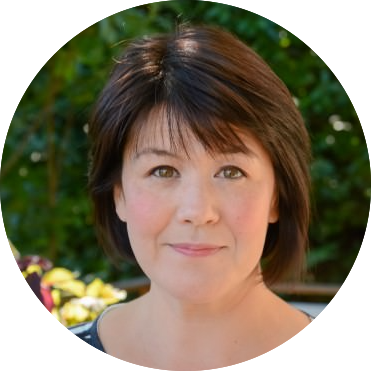 If you’ve never visited Alanna’s blog you should do so immediately. Her new cookbook, Alternative Baker is one of my newest obsessions and I’ve bookmarked almost every single recipe. I’m planning on baking a few of my favorites this weekend and giving you a full review next week, so stay tuned! The days are getting shorter, and the light is becoming a challenge. The hours that I can shoot photos has become more limited, and I’ve been a little frustrated working with these new parameters. I’ve also been experiencing a lot of recipe disasters lately and feel like I haven’t been productive. I would like you all to believe that everything I create is effortless and beautiful but the reality is that my kitchen often looks like a bomb went off in it, and sometimes, not often, things end up in the garbage. The more I delve into pushing my limits and trying new techniques the more I find the results to be disappointing, at least initially. I know that dealing with failure is a key to growth and development but some days it’s just a buzz kill. I’ve been trying to play around with video a bit but haven’t been happy with the results. I might post some of my first attempts to my Facebook page, but I still have a huge learning curve to deal with before I’ll be ready to post anything. 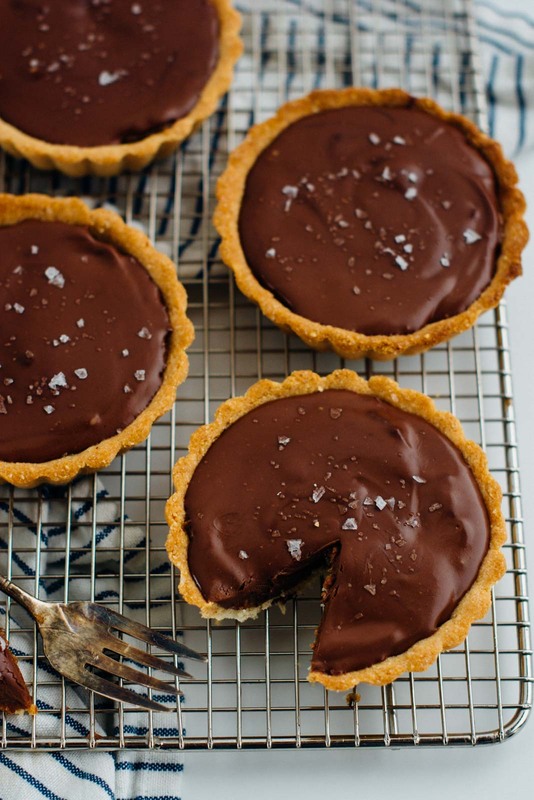 If you make these salted caramel chocolate tarts, I’d love to hear what you think. Leave a comment, rate it, and don’t forget to tag a picture #scalingback on Instagram so I can see what you came up with! 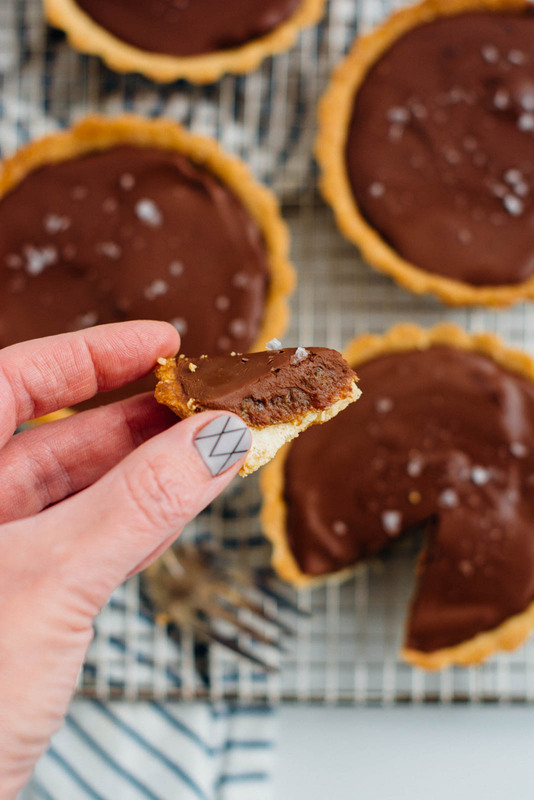 These salted caramel chocolate tarts are filled with a vegan date caramel and topped with a dark chocolate and coconut milk ganache. Pre-heat the oven to 350 degrees. Spray 4 tartlet tins with cooking spray. In the bowl of a stand mixer combine the almond flour, sweet white rice flour, coconut flour, natural cane sugar, and salt. 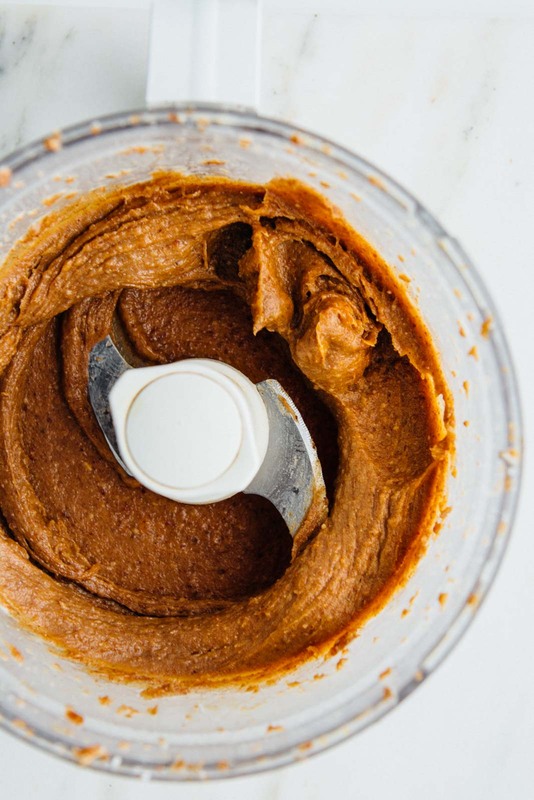 Mix on medium low just to combine the ingredients and then add the coconut oil a tablespoon at a time along with the vanilla extract until the dough looks like wet sand. Slowly drizzle in the 2 tablespoons of water and run for another minute or two until the dough holds together if you squeeze it between your fingers. Divide the mixture between the prepared tins and press the dough into the tins, starting with the sides and then finish up with the bottom. 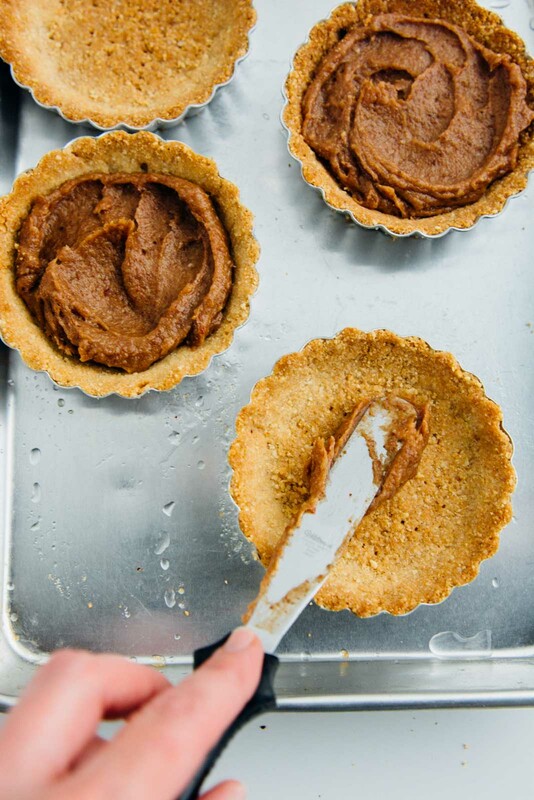 Using a fork, dock the bottom of the tart and then freeze until firm, 15-30 minutes. 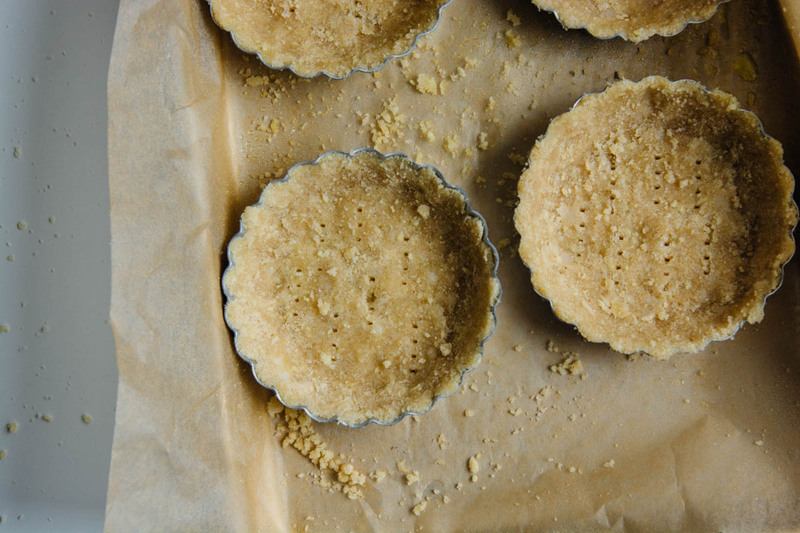 Place the tarts on a rimmed baking sheet and bake until golden, 15-20 minutes. Let cool to room temperature while you prepare the rest of the ingredients. Place a ¼ cup of the date caramel into each tin and spread evenly with a spatula. Freeze for 15 minutes to firm up slightly. Create a water bath by heating an inch of water in a small saucepan and place a heat-proof bowl over the top. 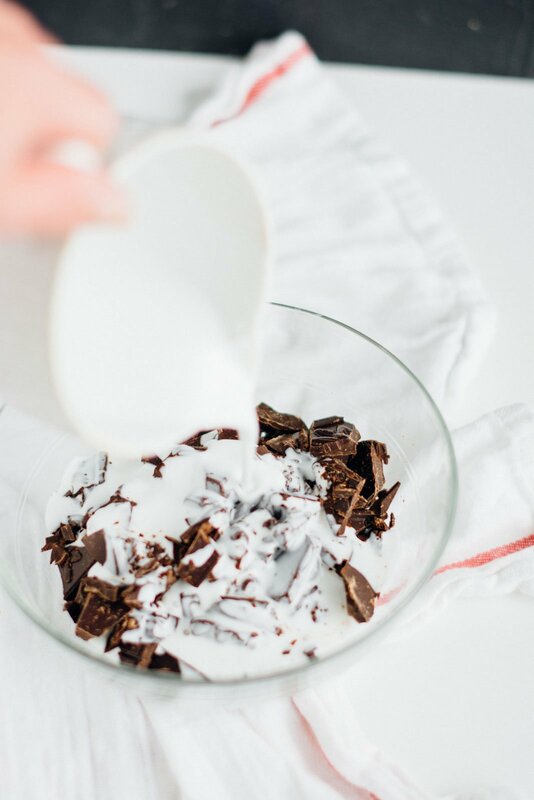 Add the chocolate and coconut milk and heat until the chocolate starts to melt. 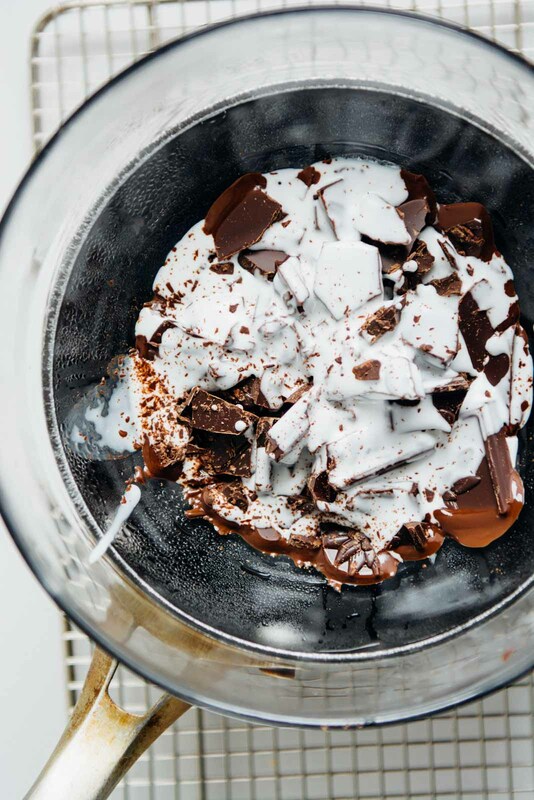 Whisk until the mixture is completely melted and smooth. 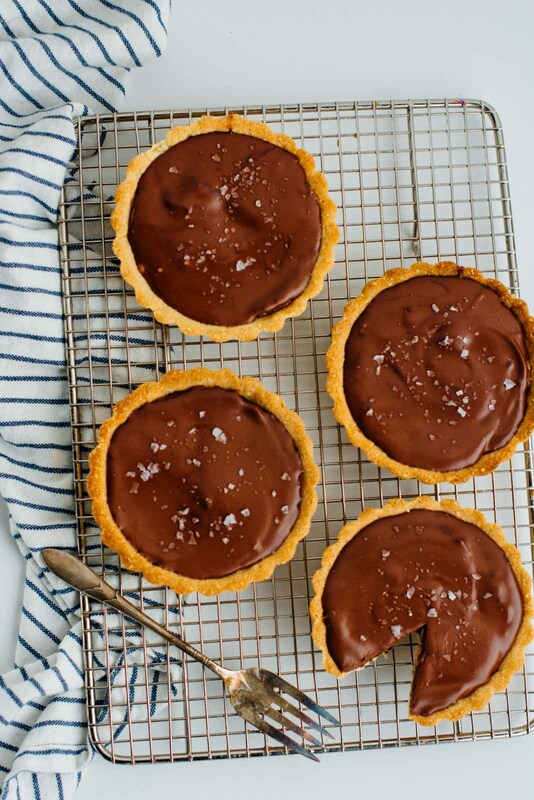 Pour the glaze over the top of the tarts and refrigerate until set, about 10 minutes and then sprinkle with a pinch of fleur de sel.